Have you heard about the skincare line Wei? You simply must head to a Space NK near you and check it out. Each and every product in the line is absolutely divine -- but none so more than the Wei Tibetan Chrysanthemum Correcting Treatment Eye Pads. Each package comes with a set of two eye pads -- oversized, round patches that you simply place directly over the eye area for about 10-15 minutes. I like to use them when my dark circles seem to be popping out of my face, or when I have a screaming migraine. The pads become cooler and cooler as they sit against the skin, so they really help to relax the tension in my head. These pads are formulated with Tibetan chrysanthemum (to diminish the appearance of puffiness around the eyes) and mulberry leaves (to get rid of dark circles). And seriously, after only 10 minutes your eyes will look completely refreshed and rejuvenated! It's amazing how well they work. I like to follow the application of the pads with Wei Mulberry Leaf 3-in-1 Eye Cream ($72), which really helps to make the remainder of the extracts sink into the skin and leave skin looking fresh and glowy all day long. 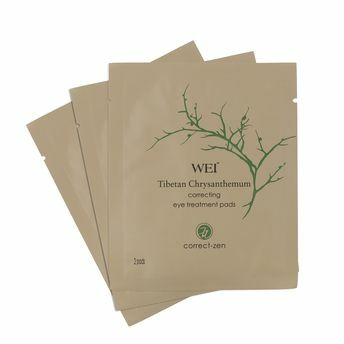 Wei Tibetan Chrysanthemum Correcting Eye Treatment Pads are $60 for a package of 10 at spacenk.com.